Psalm 118:22: "The stone which the builders refused has become the head stone of the corner." The "head stone" of this verse is translated in Hebrew as "Rosh Pinna". In 1882 a new settlement in the Galilee was named Rosh Pinna when a group of Romanian and Russian families arrived in Israel to establish a farming community near Tzfat. These families were part of the First Aliyah, a movement of Zionists who began to organize in Eastern Europe as Jewish nationalism began to awaken. These Zionists were committed to Jewish settlement and nationhood in Israel. To realize this dream they began the process of sending Jews to Israel to settle the Land. Together with nearby Yesod HaMala and Metulla, Rosh Pinna was one of the earliest of these settlements. They were heavily financed by Baron Rothschild who saw the Jewish farmers as the beginning of a mass Jewish return to the Land of Israel. Settlement in Rosh Pinna had been unsuccessfully attempted previously. However, by the 1880s, there existed an infrastructure, mostly through the offices of the Baron, to provide financial assistance and agricultural expertise to the new Jewish farmers, and success was seen as a possibility. While it took several years for the first crops to succeed, the new residents had the support that they needed to weather the difficulties, and by the early 20th century, Rosh Pinna was an established community. 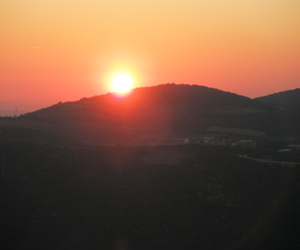 Archeologists believe that the nearby mound, Tel Yaaf had existed in the Iron Age (12th century B.C.E.) and its borders had extended to the hill where present-day Rosh Pinna is located. An ancient Roman wine press has been found in modern-Rosh Pinna, as well as what archeologists believe is the site of an ancient synagogue. Hikers in the area enjoy a number of beautiful walks, including the Rosh Pinna wadi (valley) which leads from Rosh Pinna to Tzfat, and some of the trails and caves above the town. Most visitors to Rosh Pinna find that they can spend several hours walking the cobblestone lanes of the Old Quarter of Rosh Pinna. A fascinating audio-visual presentation is available through the Local Council which details the story of the founding of the village. Afterwards, visitors can wander through the streets and alleyways of the town, visiting the galleries and eateries that dot the area. Rosh Pinna is known as the Bed and Breakfast capital of Israel, and visitors can find, often at a moment's notice, lovely rustic accommodations in the midst of the Old Town which offer a magnificent view of the Sea of Galilee to the South, and the Golan Heights to the East. The new area boasts a modern shopping center with all kinds of stores and restaurants, but many of the most interesting spots to stop are located in buildings which border the newest stores and which date back to the original 1882 village. Rosh Pinna is a town of contrasts, and is definitely not a spot to be missed.